This is the first post (and video lesson) of a three part ukulele fingerpicking blues lesson series. Once you’re ready, go ahead to part two where we learn a fingerpicking pattern to go with this. 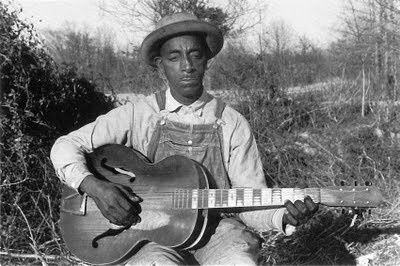 The blues has arguably been one of the most influential genres of music in the past century. The chants, spirituals, and songs of African-American slaves in the 19th century gave birth to the genre, while descendants of slaves carried their legacy into recorded form in the early 1900s. In this lesson, we’re going to take a look at one of the most popular chord progressions in traditional blues music known as the 12-bar blues. The blues are characterized by simplicity, repetition, rhythm, and pure emotion. In this video lesson, I show you some examples of the 12-bar blues on ukulele. Feel free to watch this video first, but you may want to keep reading first to understand how the 12-bar blues is structured. Before we learn any fingerpicking patterns, we need to understand the structure of the 12-bar blues. As you probably guessed, the 12-bar blues is made up of twelve bars or measures. Each measure gets four beats. Once you complete these twelve bars, you repeat the entire form. There are three chords commonly used in this pattern: I7, IV7, V7. The chords above are expressed in roman numerals. The “7” next to the roman numerals represent that the chord is a dominant 7th chord. The first four measures of the 12-bar blues are played over the tonic chord I7. This means, if we were playing in the key of A, our I7 chord would be A7, if we were playing in key of D, our I7 chord would be D7, and so on. The first four measures of the 12-bar blues is played of a I7 chord. For this lesson, we will play in the key of A, so our I7 chord is going to be A7 (click to view the finger position for this chord). For the next four measures, we are going to switch to a IV7 chord for two bars and then switch back to a I7 for two bars. Again, our I7 chord is A7. Our IV7 chord in the key of A would be D7. For the last four measures, we are going to switch to a V7 chord for two bars and then resolve back to a I7 for the last two measures. Our V7 chord in the key of A would be E7. If we put all this together, our basic 12-bar blues structure looks like this. As you can see, the structure is pretty simple. We can create a little bit more interest in this progression by using some variations. The first variation is in the first four bars. To break up the monotony of the I7, we can use a IV7 chord in the second measure. The second variation is in the last four bars. For the ninth measure, we will still use the V7 chord, but in the tenth measure, we will switch back to a IV7 chord. In the eleventh measure, we will go back to a I7 chord, and then on the 3rd beat of the last measure, we will switch to the V7 chord. The V7 chord in the last measure really helps the 12-bar progression to keep on going. This is because whenever you play a V7 (or any V chord) it wants to resolve back to the I chord. Give it a try yourself and let me know how it’s going for you in the comments. Stay tuned because in the next lesson we’re going to take a look at some blues fingerpicking patterns! Wow, I know as a newbie I am way in over my head here but this is a great challenge, yes, I am all over the shop, but sure will try, look forward to next video. I haven’t heard of this actually. I need to look it up. Do you have any examples of it that you can link to? I think that with King Bee the song I’m a King Bee is meant. Off the top of my head, I don’t have any specific recommendations. The thing with the 12-bar blues is it’s a structure that is used across many songs. This means if you know the 12-bar blues you could probably find any blues song and have a high chance of getting it to work on the ukulele. Does anyone else have some specific recommendations? I’ll try to dig up some. I love your 12 bar blues finger picking pattern.I keep practising the three chords A7th D7th and E7th. I play Twinkle,twinkle with chords-CM, FM, GM. Thanks, Brett. Regards Mary. “For You Blue” by the Beatles uses this chord progression. You show D7 as played by barring second fret with the index finger 1st string 3rd fret with the middle and then as you are playing you use the middle and I think it’s your ring finger….reason? Harry, great question. I tend to vary how to play my D7 chord depending on the chords that are coming before and after it. I find that sometimes by barring it with my middle finger it frees up my index finger to get ready for the next chord. Sometimes when I’m playing a chord before a D7 (like an A7) my index finger is wrapped up in playing that chord, but my middle finger is free, so I can switch to the D7 real smoothly. I like to choose the path of least resistance when it comes to play chords so sometimes I experiment with alternate finger positions. Thanks for showing me something new yet once again. Look forward to learning more from you with as you introduce new material. Thanks, Greg! You are welcome. Wee bairn asleep…what is there not to like about learnin’ some 12 bar blues over lunch hour…thanks mate it’s made my day. Just got a KALA archtop Tenor f hole shiny Black and sounds peachy with blues. I also I live in Brighton so thanks also for the link about Sophie Madeleine…I think I’ve fallen for her ( well actually Im married but if i was a few years younger you know). Do you know where to find more blues chord progressions? The blues link is fiddly but its’a comin’. Anyone out there…when people say if you are interested in learning past a beginner then go spend a bit of money on a better uke. It really makes you want to learn harder and faster….it’s got such a lovely ring to it. Your archtop tenor sounds awesome! Are you doing any different alternate tunings? I really like to go to low G tuning with my tenor sometimes. You are very right. There is something very inspiring about investing money into a quality instrument. I think that investment ends up really motivating us to get all that we can out of our instrument. We have something at stake… that’s very motivating! Im not one to leave posts but I have to say your awesome. I never knew the blues would be so much fun to play on the uke. Ive been playing the uke for a few years now, off and on. I try to tackle songs that are way over my level which takes weeks, sometimes months..bohemian raps. but i just need to get back to the basics of jammin. Thanks for the taking the time to post. Definitively a bluesy sound, and just after my 2nd day with an uke! Very nice. Thanks. So glad to hear it! Thanks, Asa. As an example of this progression (with the V-IV-I-I ending), I would suggest (one among a gazillion) “Crossroads”, by whoever may have recorded it, e.g. Clapton. That is awesome! Scooted outside my normal lessons with you to try this and I’m having a ball with this one. I’ve always loved the sound of the blues and had no idea you could get that feel from a Ukulele. Wonder if Stevie Ray ever tried “Mary had a little lamb” on the Uke. :-). Keep up the great work and I’m loving the lessons! Ha, this sounds fabulous on the uke! Hey Brett, thanks for this. I’m on a baritone uke and enjoying accompanying your lessons and hearing how the sounds compare! 🙂 I’ll keep working on the strumming and try this lesson again! Hey Don, it’s great to have you apart of what’s going on here at Ukulele Tricks! Welcome! So, I’m trying to teach myself the song “When Will My Life Begin” from the movie Tangled. Maybe you’ve heard of it? Anyways, it has a C#m in the song…but as far as I can tell on your Chord library, there is no C#m! I’ve tried looking it up on Google, but there are so many different chords! I can’t tell which one is really the C#m! Please help! Also, this is a great website! I just got myself a ukulele, and I love going to your website to learn new chords and songs! Thanks! The chord C#m can also be considered Dbm which may have been what was throwing you off. Brett thank you very much! Easy explained how to play the 12 bar blues! Have you got some ideas tips for good blues songs to play on the uke? I have been playing songs like St. James infirmary and cocaine blues by luke jordan. If anybody has any tips or ideas please share! Would it be erroneous to pic with I your thumb and pointer finger? Two strings each? Hey Adam, do you mean to fingerpick only using those two fingers? I’m a big fan of using as many fingers as possible. It gives you the ability to pick faster and more complicated patterns down the road. Great job Brett..I’m a blues fan learning the uke. Your lessons really helped me. Wow, you made that look easy. I’m still learning to tune my Uke but I am inspired!!! I need to – not jump ahead – and get started with lesson one, I am a complete newbie. But now I am jazzed up to think about what I will be doing down the road. I have a vision of sitting on my porch this summer and playing the 12 bar blues without my neighbours coming over to ask me to go back inside, LOL. Thank you so much for your website and tutorials! I’ve been through a few sites and I learn from your tutorials much easier and quicker than the others! It’s hard to find uke books in stores in Australia (well, where I live) and your chord library is absolutely awesome! Thanks, Amellia! Glad you’re enjoying my stuff. I’m a 74 year old who’s been strummin’ for 4 years now. Decided strummin’ isn’t enough. Found your site and I’m so happy. New challenges keep Alzheimers on the run. Haven’t been able to print the Twelve Bar Blues finger picken’ sheets. Where would I find them. Thanks for picking up my new book! There is a lot in my book if you are interested in fingerpicking. Been playing for a year or so, but just strumming (which I love and is fine for a lot of rock and pop) but have had the itch to expand to picking. This video was just the thing to get started..timeless, fundimental, familiar and fun. Makes you want to keep practicing it. I have a tenor strung bari (reentrant dGBE), so I just follow along in a different key. I can play along in same key (using bari chord shapes) but then can’t do the lick. I’d love to know how to do the lick in different keys. Bonnie, great to hear you’re picking up this picking on the baritone! I agree with you that it’d be a good lesson to learn how to play the lick in other keys. I’ll be sure to keep it in mind for the future. I’ve been trying to play Blackbird on the uke, with not much success! I seems like it should be an easy one, but I think there might be some weird rhythm changes in the song. Any chance you might be able to show us how, or help with the strum pattern? Just want to say a big thanks for making it so easy to learn. Years ago before I was IT savvy tried learning to play guitar but couldn’t get access to good resources and gave up as I didn’t take well to it. Bought my uke a couple of weeks ago along with a book for beginners, learned a few chords quickly but learning tunes is slow going. But thanks to your online tutorial I’m playing 12 bar blues and my strumming is markedly improved already, it’s amazing. I never thought it possible. It’s inspiring and I’m loving it. Your teaching style is wicked, no mess, no fuss. I’ll be recommending you. Cheers mate. Steve, Wolverhampton, England. You’re very welcome, Steve. So glad to hear you’re having success learning to play the ukulele! Keep up the great work. Hi Brett!!! I absolutely loved this lesson (and the next two), they really helped me a lot and I’m almost there with the fingerpicking!! Absolute class! Just one question… Can you please tell me what you do there after you play the lick at the end of this video?? I can’t get the chords you play at the end! I got the lick from the next video but now I would like to learn how to get back and start from the beginning straight after the lick!! I’m an absolute beginner and can’t get the chords sorry ^____^ Thanks a million!! Cheers from Italy!!!! Hi Elena, as you probably learned in the video where I demonstrate the lick, I play the lick over the entire second to last measure (measure 11). For the last measure, I play an A7 chord on the first two beats, and then, an E7 chord on the last two beats to “turn it around” to begin at the top again. I luv your style, it’s so easy to learn from you but I’m having a little difficulty following the rhythm and chord change in the third example of the 12 bar blues video tutorial. The rhythm itself is fantastic fun to play along to and I want to enjoy it more. Can you explain what you’re doing just before the finger pick riff, what chords are played? And then after, thru to the end of the rhythm. It sounds to me that a slightly different rhythm is played in the last bar. Cheers bro. Thanks for that Brett. I get the finger picking part, that’s easy to follow, I love it. The first two examples (in the video above) you explain very well. I could really use a bit more explanation for what’s happening in the final bar of example #3. What I don’t get is the chords and rhythm you play in bar 12 after the finger pick. Do you play A7 or Amajor, then go to E7? Or do you just play E7 thru bar 12 before starting again on Amajor in the first bar? I must have watched it a thousand times, the rhythm in bar 12 seems to change as well and it’s driving me crazy trying to keep up with you. Please save my sanity. Big thanks for being there. Hi Steve, not a problem. I play the lick over the entire second to last measure (measure 11). For the last measure (measure 12), I play an A7 chord on the first two beats, and then, an E7 chord on the last two beats to “turn it around” to begin at the top again. Does that answer your question? Thanks Brett, perfectly explained. I see what you’re doing now. Got myself in a dizzy strum getting the rhythm right to keep up with you. I just love the tune and you play it so well, now I’m more confident about it. With your help, my girlfriend is really impressed with how quickly I’ve developed my playing already. I wish you were here, I’m really itching to learn more tunes. Best wishes. PS, where are you based – in USA? Hey. Great to hear other peoples comments and that im in the same boat as others. We have a great coach here in our club and he has set us “twenty flight rock” and “goody goody” – I know the first is 12 bar blues at least and uses a similar progression as in the lesson for those interested in an example.I use a 2020 D7 which simplifies things (a bit). Only problem is you can fall into trap of speeding it up – great sing so have a listen to original. I add my thanks as well to B. Very generous with knowledge and time. You can also play the song “Move it on Over” by Hank Williams, (later covered by George Thorogood) with this chord progression. Thank you Brett, it’s loads of fun. Plus you can play a simple solo, all on the “a” string, using the pentatonic scale. Use the frets 0, 3, 5, 7, 10, 12, 15. Just follow the dots. Good luck, and as always, hope this helps. I am having a total blast with my ukulele. Very fun to play. Thanks for sharing Brett! Which variation of each chord do you use? Thanks for all the help. In the 12 bar blues. Somewhere you showed how the lick is played. Can’t find it.